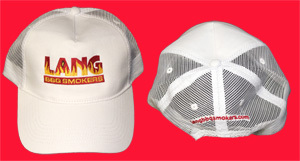 Lang Manufacturer White Half Mesh Hat White hat with Lang BBQ Smokers? logo. The back of the hat is white mesh material. White hat with Lang BBQ Smokers? logo. The back of the hat is white mesh material.